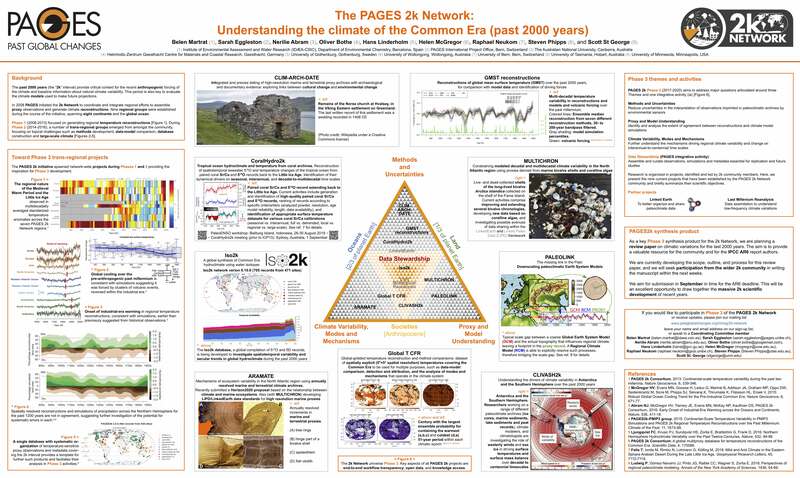 PAGES 2k Network is a long-running initiative studying past global changes of the last 2000 years. Sign up to the 2k mailing list. Access the group's latest poster here (pdf). - Further understand the mechanisms driving regional climate variability and change on interannual to centennial time scales. - Reduce uncertainties in the interpretation of observations imprinted in paleoclimatic archives by environmental sensors. - Identify and analyse the extent of agreement between reconstructions and climate model simulations. The past 2000 years (the "2k" interval) provides critical context for our understanding of recent anthropogenic forcing of the climate, as well as baseline information about Earth’s natural climate variability. It also provides opportunities to improve the interpretation of paleoclimate proxy observations, and to perform out-of-sample evaluation of the climate and earth system models that are used to generate projections of future climate change. In 2008, PAGES initiated the 2k Network to coordinate and integrate regional efforts to assemble existing proxy data and generate climate reconstructions. Processing ice cores in Antarctica. Credit: Nancy Bertler. Nine regional groups were established during the course of the initiative, spanning eight continents and the global ocean. Phase 1 (2008-2013) focused on generating regional temperature reconstructions. During Phase 2 (2014-2016), a number of trans-regional groups emerged from amongst the community, focusing on topical challenges such as methods development, data-model comparison, database construction, and large-scale climate. There are many ways to be part of the PAGES 2k community. You may contribute to the ongoing database and knowledge-base efforts with your data and expertise. You may initiate a new 2k project, or participate in an emerging one by contributing towards project coordination, data-analysis, interpretation or writing. Members from related communities, including CLIVAR scientists, are warmly welcomed to join or even initiate 2k projects. Visit the projects page to learn more about ongoing projects or to propose a new one. This group is open to anyone who is interested. If you would like to participate in Phase 3 of the PAGES 2k Network or simply to receive updates, subscribe to the 2k Network mailing list here or contact a member of the coordinating committee.